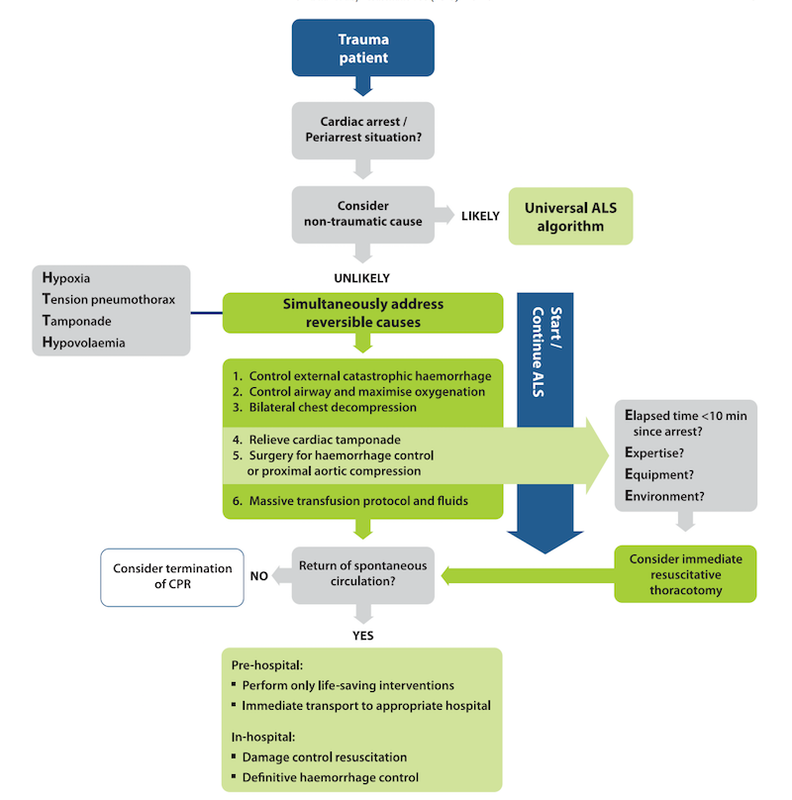 Our Standard Operating Procedure for the management of traumatic cardiac arrest prioritises the rapid management of reversible causes (hypoxia, tension pneumothorax, hypovolaemia, and cardiac tamponade). Although it has been in operation for several years, it can still appear unfamiliar to ambulance crews and other rescuers as external chest compressions and intravenous adrenaline (epinephrine) are often omitted so that other proactive clinical interventions can be instituted. ILCOR (the International Liaison Committee on Resuscitation) has now completed its five-yearly consensus review and the European Resuscitation Council (ERC) and American Heart Association (AHA) have published their updated 2015 guidelines on cardiac arrest management, including traumatic cardiac arrest. The Australian and New Zealand Resuscitation Councils usually publish their guidelines a bit later, which do not tend to differ significantly from the European & American versions. Traumatic cardiac arrest (TCA) carries a very high mortality, but in those where ROSC can be achieved, neurological outcome in survivors appears to be much better than in other causes of cardiac arrest. The response to TCA is time critical and success depends on a well-established chain of survival, including advanced prehospital and specialised trauma centre care. Immediate resuscitative efforts in TCA focus on simultaneous treatment of reversible causes, which takes priority over chest compressions. • massive trauma incompatible with survival (e.g. decapitation, penetrating heart injury, loss of brain tissue). • no detectable ultrasonographic cardiac activity. all interventions other than definitive (surgical/radiological) haemorrhage control appear prior to ‘transport to hospital’. Thirteen percent of all cases of TCA are caused by tension pneumothorax. To decompress the chest in TCA, perform bilateral thoracostomies in the 4th intercostal space, extending to a clamshell thoracotomy if required. In the presence of positive pressure ventilation, thoracostomies are likely to be more effective than needle thoracocentesis and quicker than inserting a chest tube. Cardiac tamponade is the underlying cause of approximately 10% of cardiac arrest in trauma. Where there is TCA and penetrating trauma to the chest or epigastrium, immediate resuscitative thoracotomy (RT) via a clamshell incision can be life saving. The chance of survival is about 4 times higher in cardiac stab wounds than in gunshot wounds. Ultrasonography should be used in the evaluation of the compromised trauma patient to target life-saving interventions if the cause of shock cannot be established clinically. Haemoperitoneum, haemo- or pneumothorax and cardiac tamponade can be diagnosed reliably in minutes, even in the prehospital phase. 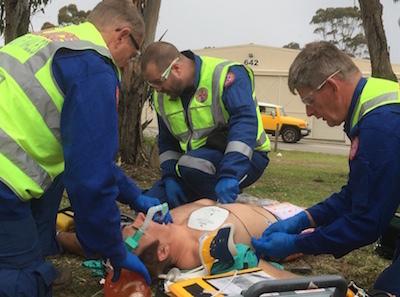 Our Traumatic Cardiac Arrest Operating Procedure was first approved in 2009, and was based on the best available evidence and experience of our HEMS clinicians who have trained in many services within Australia and overseas. The apparent deviation from ‘standard ACLS’ practiced on trauma patients did require some discussion and defence. Our literature review and recommendations published in 20132 remain pertinent and our operating procedure is now consistent with international guidelines, thanks to the evolution of evidence and the consensus process of ILCOR. Of course, it is still an evidence-light zone and some measure of the effectiveness of this approach is much needed. Survival is still very poor from traumatic cardiac arrest and we all need to collaborate on improving practice in a clinical sphere where small gains can mean massive differences to patients and their families. I was interested in your comments on the new ERC TCA algorithm. Whilst welcoming the written guidelines, I feel the algorithm is dangerously flawed. Algorithms are designed to lead an individual or team through a sequential series of actions, without omission, before proceeding. The ALS algorithm possibly being the most well known in medical practice; each step is completed in turn and it would be foolish to omit a step e.g. defibrillation. In the TCA algorithm, taking this approach could lead to inexperienced practitioners ‘controlling the airway’ and (even worse) performing bilateral chest decompression unnecessarily, as these actions are embedded with the algorithm. For these and other reasons, the Resuscitation Council (UK) will not be using this algorithm and have produced one which we feel is in keeping with standard algorithm construction to ensure safe practice. This can be found on the RC (UK) website (www.resus.org.uk).